For the final leg of her Tuesday trip, author Nikki Tate arrived in Rossland’s Summit School to present her award nominated book. 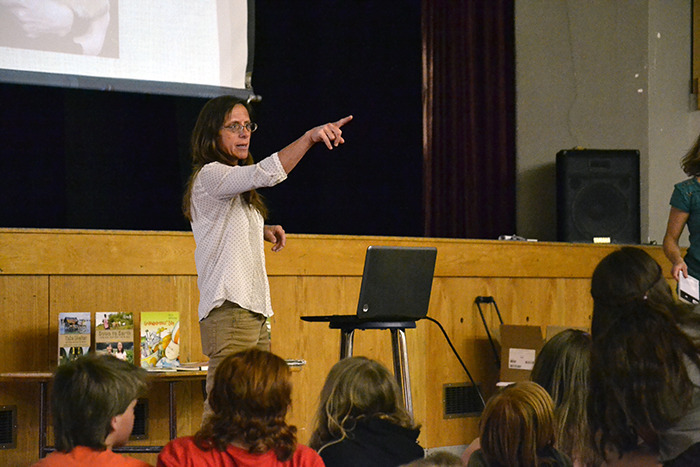 For the final leg of her Tuesday trip, author Nikki Tate arrived in Rossland’s Summit School to present her award nominated book and engage the students in environmentally conscious discussion. Nicole Tate-Stratton is her given name, however Nikki Tate is the pen name used for her children’s publications, of which she has several. Additionally, Tate has authored many books ranging from fantasy to biographies to those for reluctant teen readers. Presented by the Rossland Public Library, Tate presented not only her newest non-fiction book — nominated for a Red Cedar Award — Down to Earth: How Kids Help Feed the World but shared some of her life stories and writing process secrets. This book and the others in its series, take a closer look at food, health, waste management and various environmental concerns. Tate believes it’s more important than ever that youth understand the impacts and consequences we as people have on the Earth. The author said she feels her generation and earlier really dropped the ball with these issues and younger generations now feel the responsibility and awareness towards what is ahead for them. After her presentation, Tate was thrilled with the response she received from the young audience.